Uploading your logo is quick and easy. Take a look at the video and the step by step directions for guidance. Step 1: First make sure that you have your company and mobile logos saved to your computer. You will need to access the images after a couple short steps on the Profit Rhino web portal. Step 2: Log into your Profit Rhino account. Once you're logged into your account, click on the 'My Account' button in bottom left hand corner. This will put you on the first of five sections on the My Account page, which is titled 'Account' (see left hand side of page). Step 3: Remain on the Account section of the page and scroll to the bottom. Below 'Address' you will see two sections titled 'Company Logo' and 'Mobile Logo'. Click the 'Choose File' button beneath 'Company Logo'. Step 4: From here you will be prompted to select a saved file from your computer. You will need to find the location on your computer where the image is saved. Either double click the image, or highlight the image and click 'Open'. Step 5: Once selected, you should see the 'No File Chosen' description next to the 'Choose File' button replaced with the name of the file you've selected. Repeat the file selection process for 'Mobile Logo'. Then click 'Upload'. Step 6: You should see a green 'Upload Successfully Saved' message flash across your screen. Scroll to the top of the page where you should see your image now loaded in the top right hand corner of the page. The 'Mobile Logo' image will also appear while using the mobile app. 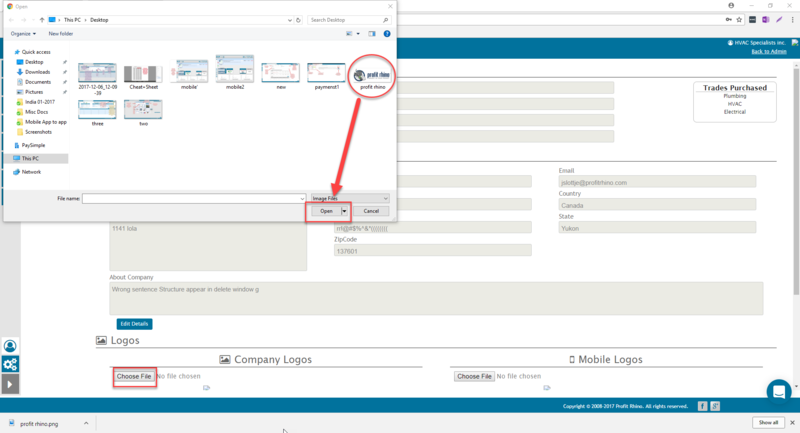 Step 7: Enjoy your personalized Profit Rhino web portal and mobile app!